Combined with the optional mColor RIP and Workflow Software, the MACH 6 delivers professional-level color quality control. Exceptional print quality plus speed translate into the lowest per-piece cost and fastest ROI for direct mail and transpromotional marketing printing. A breakthrough in the world of mailing and packaging, the MACH 6 features a wide enough throat to accommodate 10” x 13” flats and mailers up to 10.5″ x 17″, as well as a 3/8” thick transport to be able to run padded envelopes, chipboard, corrugated cardboard, folded cartons and more. All of this in addition to the traditional #10 envelopes, cardstock, invitations and more that its predecessor, the MACH 5, could accommodate. Mail centers, print shops, packaging centers and marketers of all sizes can take advantage of exceptional color printing resolution and printing speed. 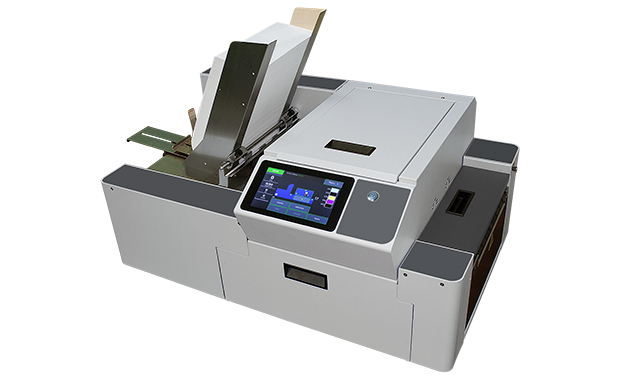 The MACH 6 is also great for mail addressing, barcoding, postage printing, and more.